AO Blog > California Rivers: Flows, News, Events > North Fork American > Holy Flooding on the North Fork American River! Holy Flooding on the North Fork American River! 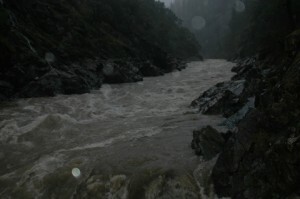 Scott A, the intrepid man at the helm of AO Rafting recently headed out into the deluge to check out the waterfalls and mayhem on the North Fork of the American River, which always puts out a great show after spring rains. 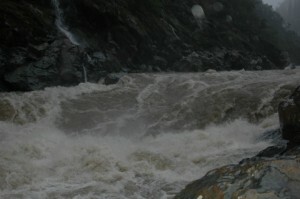 The photos he took on his rainy hike (yes, he’s a bad *** but no, he wasn’t out there rafting this! 18 grand really is too high — we’ve maxed out at 5,500 in the past) really capture the difference between “normal” and “high water.” In the first picture you see the Chamberlain Falls rapid running at 18,000 CFS. Yes, that’s 18 GRAND. 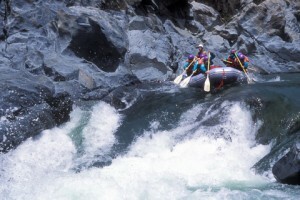 In the next, you see it at normal flows of 1200-1500 CFS. Quite a difference, no? That huge boulder you see above the guide in the white helmet is completely submerged in the flood picture if that helps you get a picture of the transformation this kind of leap in CFS causes. In these other pics look at the difference in the color of the water–not only is the canyon flooded but that beautiful green the North Fork is known for is completely clouded with swirling mud and debris from the storm. 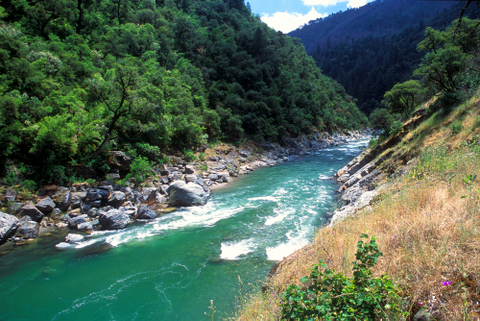 To get a feel of how this river looks and operates during standard spring flows, check out our North Fork American River Rafting Video.